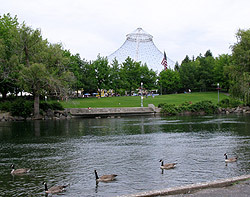 The first leg of our July vacation took us to Spokane, Washington, a medium sized city that's closer to Idaho than the Pacific Ocean and encased in a bubble of hot, dry, Midwestern air that corrupts the acoustics of the city name into "spo-CAN". As cities go, Spokane was fairly pleasant, with a like-named river running through the center, and all manner of bridges, waterfalls, and weird art decorating the downtown area for the benefit of tourists. A giant grassy park sits on an island in the middle of the river, filled with the usual mix of homeless people listening to heavy metal on their radios, shaved ice stands, goose poop, and a permanent fair, complete with a small roller coaster resembling the Scooby Doo at King's Dominion, and bumper cars. We had come to Spokane, along with the rest of the population of Grinnell, Iowa, for the wedding of one of Rebecca's college friends, and the couple had put together a complete itinerary for the out-of-towners which comprised most of the attendance. In a contrast of ambition, our wedding encouraged out-of-towners to stay at the beautiful Days Inn in the industrial park of Leesburg, and drink $800 worth of wine at the venue itself. After a pre-wedding pizza party the night before, and several rounds of "Dirty Mad Libs", followed by breakfast in the all-you-can-eat bacon bar at the hotel, the wedding itself took place at the Patsy Clark mansion in western Spokane. Although we were initially confused and believed that it might have been the home of a country singer, it turns out that Patsy Clark was only notorious for having a girl's name and being rich, having earned his money through mining in the 1800s. The wedding was even shorter than an episode of the Office with commercials cut out -- a fine accomplishment for any outdoor wedding whose climate could be confused with the temperature of the human body -- and it was followed by five hours of partying before the noise curfew, and two hours of bar'ing behind the hotel afterwards. Because the new couple apparently had an incredibly high tolerance for entertaining guests, the third day of the wedding weekend opened with a brunch at their home, replete with bagels, Starbucks, and mimosas. 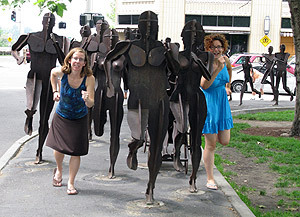 Afterwards, we braved the mid-90s heat to explore such classy Spokane attractions as the mall and a Mexican restaurant. Our flight out of Spokane on Sunday was scheduled for 6:50 PM at Spokane International, although "International" seems to be a distinction assigned to any old airport these days (see also, Energy Star appliances) since there were only 16 gates to depart from. In spite of this, our flight never appeared on the departing flights board throughout the evening, and we finally just started roaming the concourse around 6:40, looking for United signs. We made it on the tiny plane, which had overhead bins the size of labradors and required us to walk across the tarmac, check all our bags planeside, and climb up some stairs into an artery with only two seats per side. Our flight arrived in San Francisco around 9 PM, and we were welcomed by a gust of frosty 60 degree air.